Because I’m a singer, I am often asked how to get rid of a cold. My personal remedy is very simple: SLEEP! 9 times out of 10, I can fight off a cold virus by taking a nap. But when sleep doesn’t work, I do have some favorite products. And since I’m a frequent flyer, I travel with my own personal pharmacy. Some singers hoard antibiotics. This is generally a bad idea. Always consult a doctor before indulging in the meds that end in -cillin and -mycin! But what do you do if you get a toothache on the day before an important audition in Germany? Two weeks ago, I was preparing an audition when the left part of my jaw started to ache. An impacted wisdom tooth had chosen this particular day to get infected. So I did what anyone would do: I sent a panicked text message my dentist in Pasadena! He texted me a prescription for Amoxicillin. (Hooray for technology!) When I got to the local Apotheke (apothecary), I simply handed my iPhone to the pharmacist. She squinted at the screen and asked me in German, “Is this from a real doctor?” I was able to demonstrate my dentist’s credentials, so I got my meds. The next day, I went to my audition happy and pain-free. If you know another product that works for you, please tell me about it in the comments section! I’m actually very healthy, so I haven’t had a chance to sample many things! But I’m constantly asked about these products, so I like to be well informed. Some singers also take beta blockers to deal with nerves. I have never done this because I don’t like to play around with my biochemistry. Avoid the powerful drugs, people! They can affect your voice. They can affect your life. Just say no. In the world of pharmacology, a little goes a long way. I will never forget how helpful it was to have Imodium when I landed in Kathmandu and discovered that I was allergic to yak’s milk (yaktose intolerant?). Or the herbs that I drank when I had an unexplained fever in Tokyo. 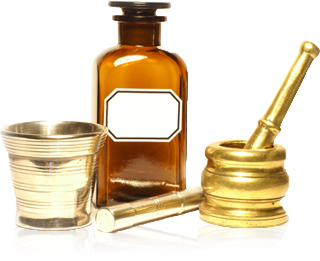 These were just simple over the counter remedies, but they made it possible for me to get onstage and sing all my concerts. Here’s a link to a funny little video about opera singers and hypochondria. Stay healthy! Passport covers just don’t get better than this. A durable leather wallet with the words “jet setting diva” in sparkling turquoise letters! 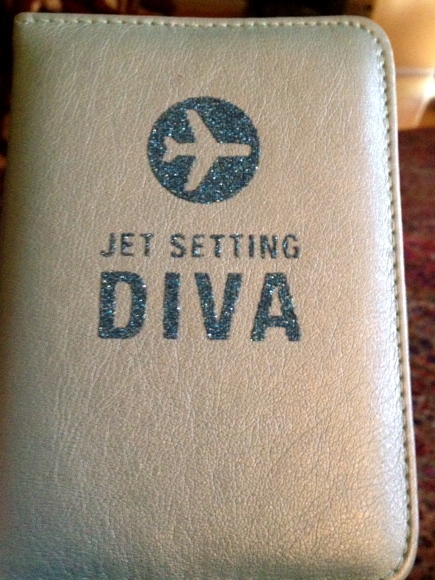 Those of you who read my post, “My Life in Passport Photos,” know that I was jealous of my friend Mirva‘s pink “Jet Setting Diva” passport cover. So I got one of my own. My new passport cover made its maiden voyage to Europe two weeks ago. I was curious to know how customs officials and airport personnel would react. The next day, as I boarded a plane in London, a lady behind me admitted that her daughter would love to have one just like it. 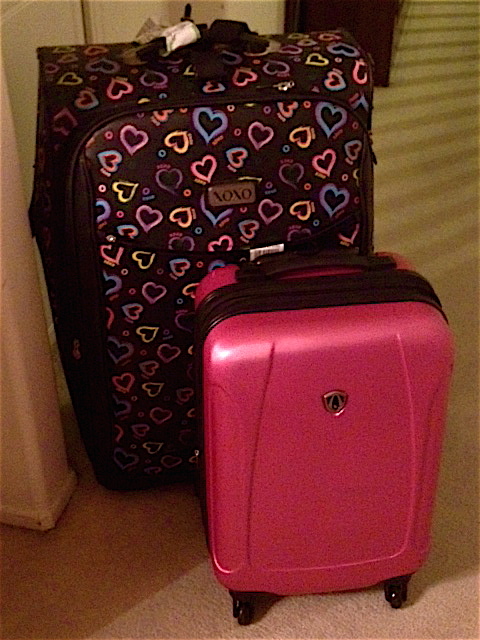 CUSTOMS OFFICER: Jet setting diva? Whoa! What kind of work do you do? ME: I’m an opera singer. So it’s official. Having a cool passport cover will make your voyage that much more fun. I highly recommend it. 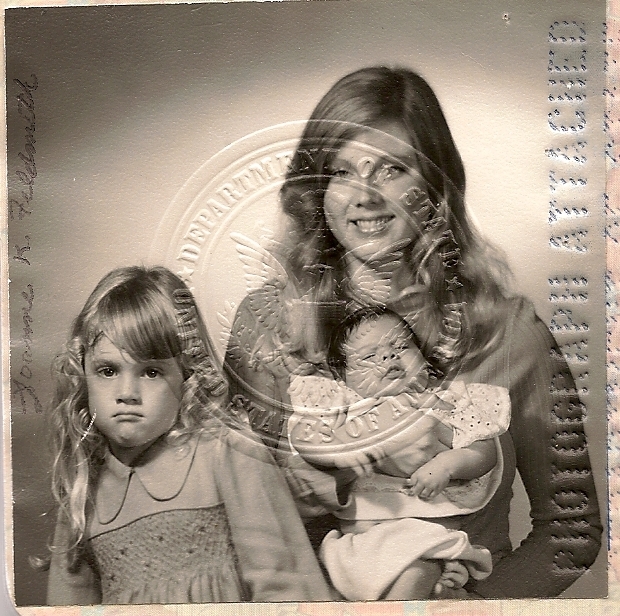 My parents must have known that I would become a world traveler: I was issued my first passport at the age of 4 weeks! I was born in Hollywood, but my family moved to Scotland a few weeks later so that my Dad could earn his PhD at the University of Edinburgh. This photo tells a whole story: my Mom looks like a supermodel (she still does.) My sister Heather is obviously not thrilled about the whole passport picture experience. But I appear to be sleeping through it. In fact, I’m told that I slept through the entire transatlantic flight! Perhaps this explains why I am still able to sleep on planes: early conditioning. As we boarded the plane, I followed after Heather, clutching a purse, a diaper bag, an overstuffed carry-on case and wearing a backpack designed to carry a toddler. At barely two months of age, Lindsay was only a sleeping bump in the bottom of the backpack but as I edged down the aisle, one of the shoulder straps broke! The pack began to sway gently from side to side behind me. Unable to even turn around, I went white and yelped! An attendant quickly figured out the problem and helped me re-fasten the strap while I started babbling that we were moving to Scotland for three years and, and, and…. “I didn’t think you were going for three weeks, Luv,” he said with a wry smile as he helped me limp to my seat with the baby and the luggage. We were seated next to an elderly lady in a black chador who seemed terrified, gripping a row of beads, rocking back and forth and softly chanting prayers throughout the take-off. That was our first flight to Europe. It’s quite fortunate that I didn’t get dropped on my head before I’d even had a chance to travel the world. 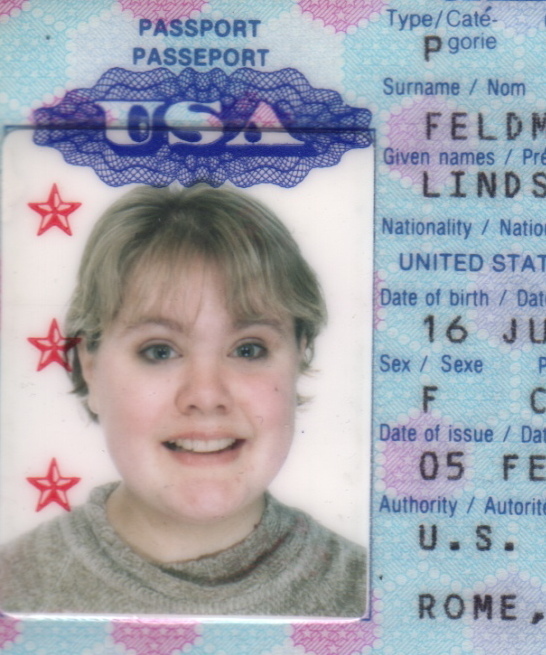 But my real passport drama occurred in Rome, twenty years after that first international flight. I was in Italy for the very first time, and as a naîve young music student, I managed to get my passport stolen before I had even laid eyes on the Colosseum! So I spent my first day in Rome at the American Embassy on the Via Veneto. I ducked into an automatic photo booth to get this photo for my temporary replacement passport. After the blinding flash, I staggered out and handed the picture to the Italian man behind the desk. He glanced at the photo, did a theatrical double-take, kissed his fingertips and exclaimed, “Ma che bella! È venuta bene, la foto, no?” I smiled and blushed. It was a very Italian moment. My “Roman” passport served me well. I got it extended at the U.S. Embassy in Vienna and filled it up with stamps (and student visas) from Austria, Italy, Spain, Japan, Russia and a host of other countries. 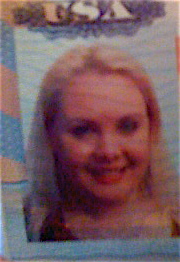 But then before I went to Nepal and Thailand in 2009, I decided it was finally time for a new passport. Just a couple of days ago, I discovered that my friend Mirva Lempiäinen (a world-traveling journalist who writes a fabulous travel blog for Finnair) is in the possession of a pink passport cover that reads “JET SETTING DIVA.” Seriously. Yeah, I gotta get one of those. Happy travels, everyone! My hair is often described as “baby hair” because it’s as fine as an infant’s. It falls past my shoulders and I can coax it into various shapes with sophisticated hair products. But unlike my sister, who had waist-length curly hair by the time she was 12, I did not get the long-hair genes in the family. So what do I do when I am cast in an opera as a 15th century Spanish maiden and I am supposed to wear longer locks? I found them at a local beauty shop in L.A. for $29.99 but you can also buy them online. 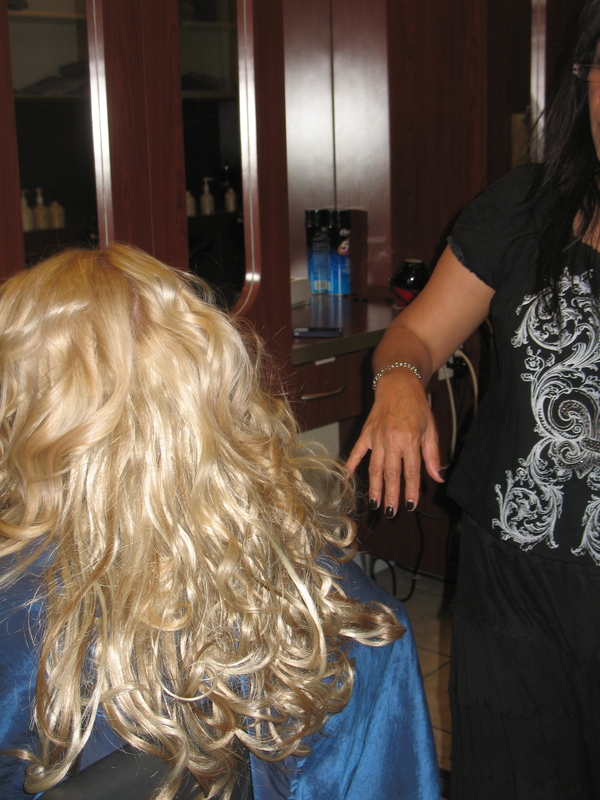 I used the two-piece wavy system in the color “Golden Wheat,” which has subtle brown low-lights, but these wash out in the stage lights for a super blonde look. (My signature hair color.) 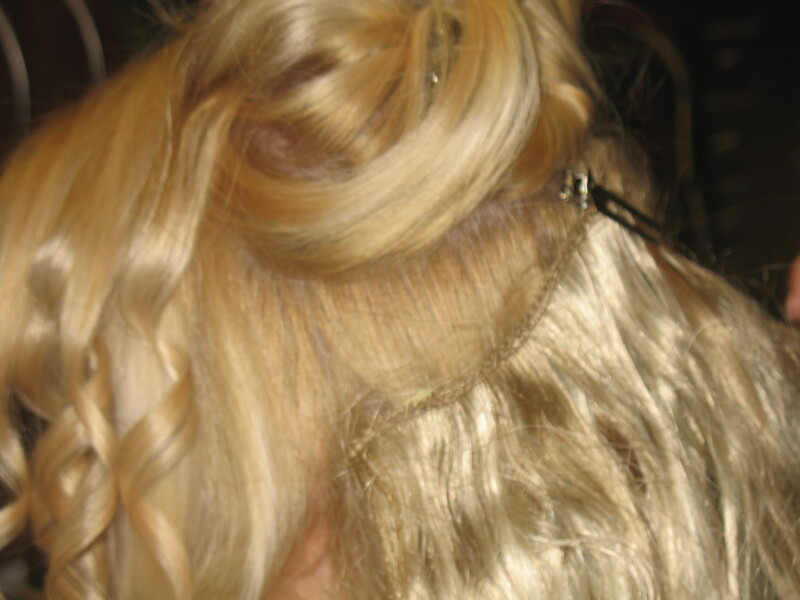 They stayed in place beautifully; I sang a two-hour opera without worrying about my hair even once. And then allow the rest of your hair to fall naturally over the lining. 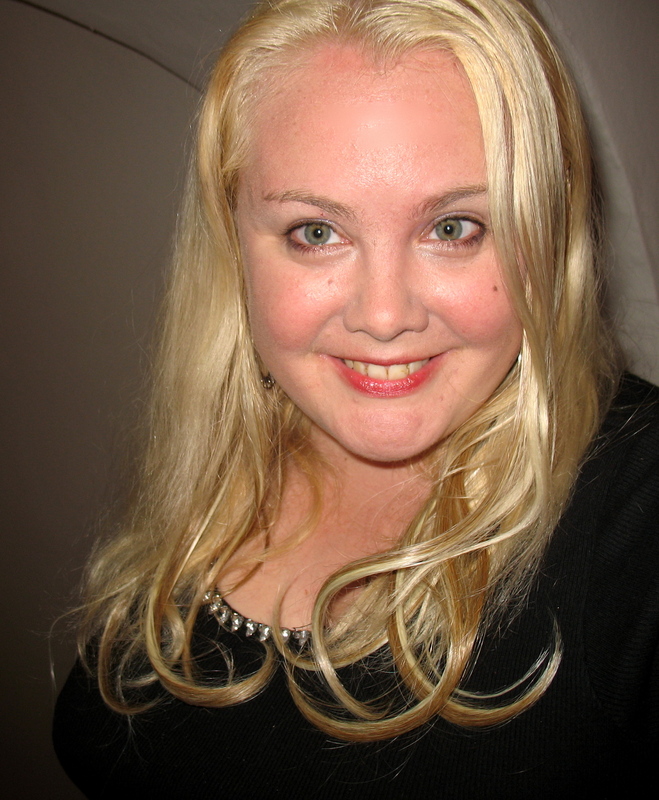 Now for a more contemporary look, I use straighter extensions with honey lowlights: And of course, you can always add in strands of red or brown (or purple or pink) if you want to add some cool highlights for a night out with your friends without frightening your boss the next morning. 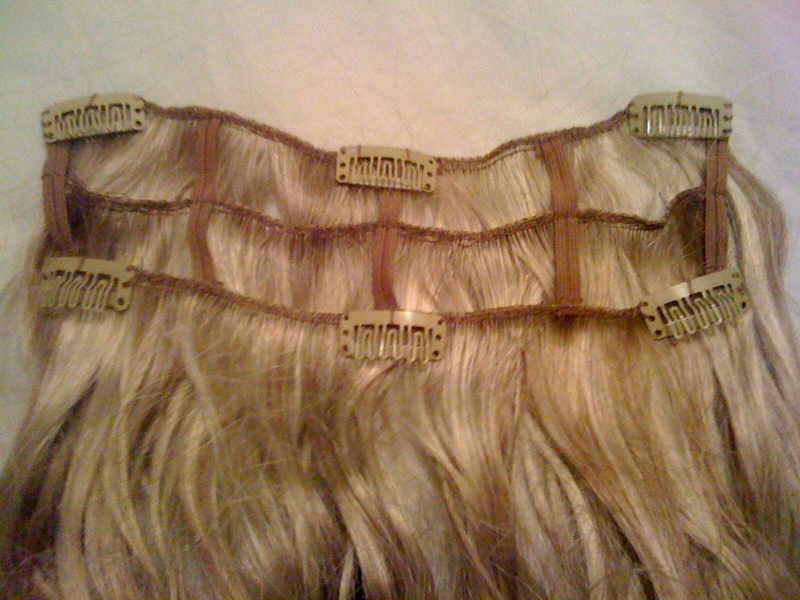 Just clip them in and unclip them when you’re done. These extensions are fun and fast and they don’t damage your hair. But those of us with sensitive hair do need to be a little more careful: I never sleep with my extensions, and I double condition my hair the next day. 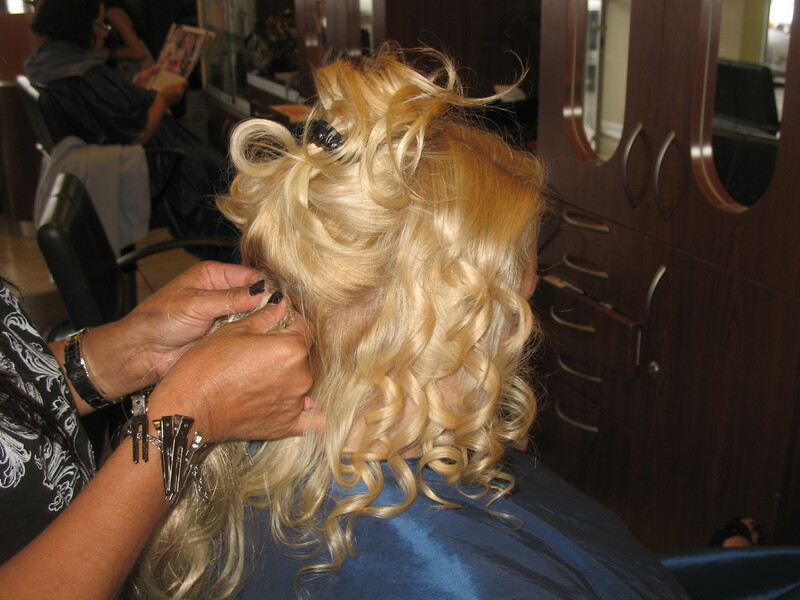 Never apply heat to synthetic extensions; only use your curling iron on human hair. Have fun! My favorite jewelry box is a miniature mahogany wardrobe that I picked up at a street market in Bangkok. The bejeweled doors and secret compartments make me feel like a Thai princess whenever I touch it. The wood shrinks and swells, and I have to open the drawers ever so slowly, so as not to disturb the tiny jade tiger who sits on the top of the box with his teeth bared. I carried this treasure across the Pacific in my lap, but it is far too fragile to come with me every time I board a plane. When I travel, I use a hanging jewelry organizer instead. It is simple and functional and I got it on Amazon for just $7.42! Obviously, this is not appropriate for your most delicate jewelry. That diamond necklace will need its own cushioned box! 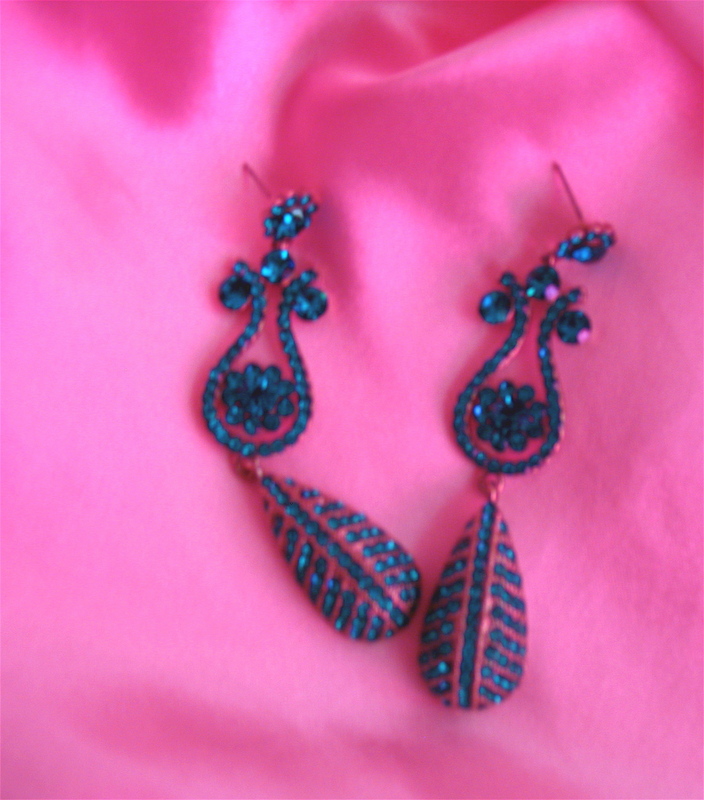 But a hanging organizer is perfect for the traveling diva on a budget, who needs to pack her cache of costume jewels without adding too much bulk to her luggage. My own “hanging jewelry box” has 37 zippered compartments. Never get an organizer without zippers – even sparkly objects tend to shift during flight!